For a while I was getting concerned that The Hex Dispensers may have called it quits. It had been a bit since their last full length and although there have been some 7"s in the last few years, it just sort of seemed like the band was put on the back burner. 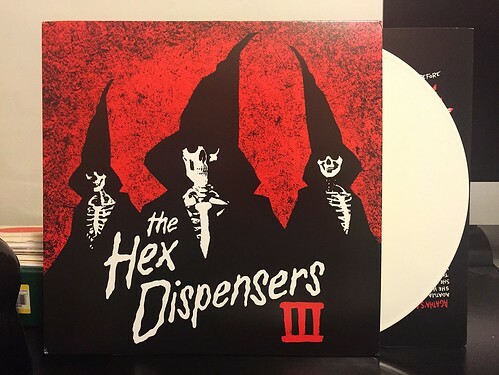 Luckily I was wrong and The Hex Dispensers are back with their appropriately titled third LP III. I can't say that I like it as much as their other records. While still a good listen, I feel that it is missing a little bit of the speed and energy of their prior works. Everything is decidedly mid tempo and while some of the songs are still great and most are pretty darn catchy, I find myself wishing there were a few that just ripped. Another thing that I think hinders this record is the production. The guitars sound really bassy and kind of muddy. You could argue that the murky guitar adds to their Ghostbusters meets the Marked Men sound, but I prefer the chainsaw blast of their other records. My last complaint is that 6 of the 10 songs on this record were previously released on 7"s that I bought. While I realize that most people who will buy this album probably don't have all of those 7"s, I still would have preferred a few more songs I hadn't heard before. All those complaints probably makes it seem like I'm really down on this record, but I'm not. I'm perhaps comparing it unfairly to past works, but judging the record on its own merits, it is a fun listen. In particular the one, two, three punch of "Parallel," "Trapped In Amber" and "Agatha's Antlers" starts the album off with a real bang as all three songs just have killers hooks. "I Hope The Sun Explodes Today" is also a highlight with a killer verse and some nice call back 'aaahhhs' in the chorus. All in all, it is definitely worth picking up, especially if you don't already have all of the 7"s. It's a fun record and the band has always written interesting lyrics and melodies. Dead Heavens - History In My Hands 7"
Brat Kings - Good Drugs 7"
Sweatshop Boys - Always Polite Never Happy 7"